Access to exceptional education programs is paramount to the success of all National Ski Patrol members, who are required to continually update their skills. The NSP maintains its high standards of providing the best on-slope safety and service by providing our members with the opportunity to become more knowledgeable and to enhance the skills they need to carry out their duties. Programs, classes, clinics, meetings and corresponding materials are offered throughout the country and around the world. This effort enables members to provide the highest quality standards of training and assures quality through instructor support. 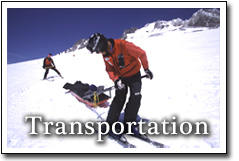 Unique to the National Ski Patrol, the Transportation Program offers guidelines for area management to use to set the standard of training for its patrollers who operate toboggans. From training of basic candidates to honing the skills of Transportation instructors, this program ensures training opportunities for members of the NSP. If a patroller desires to improve in their Alpine skills but doesn’t want to become a senior candidate they are welcome to attend the enhancement seminars scheduled in the Region. Groupings for those events are based on participant interest. In addition to the events within the region, patrollers are encouraged to attend Patroller Schools scheduled throughout the Division. The Patroller School provides skill specific training on senior level terrain with the same T/E’s used for the Senior S&T/OET program. The Patroller School is open to all skill levels from Basic to Senior. Even Certified patrollers can use this individualized training to keep their skill level at its peak. Patroller School training is listed on the Eastern Division Calendar.